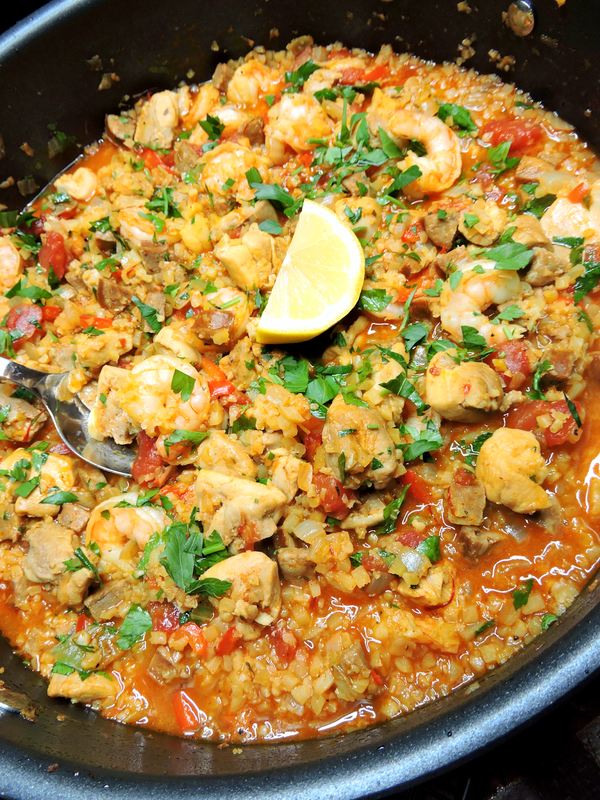 Paella is one of my favorite one-pan meals. It's simple, filling, and bursting with flavor... and I couldn't wait to come up with a Paleo version! The one thing I don't always love about Paella is that it takes some prep time. So once I got my hands on the frozen riced cauliflower from Trader Joe's, I was even more excited to make this... because it makes it that much easier! I love the smoky heat in this dish, and how it pairs perfectly with the fresh, bright flavors from the tomatoes, lemon, and fresh herbs. 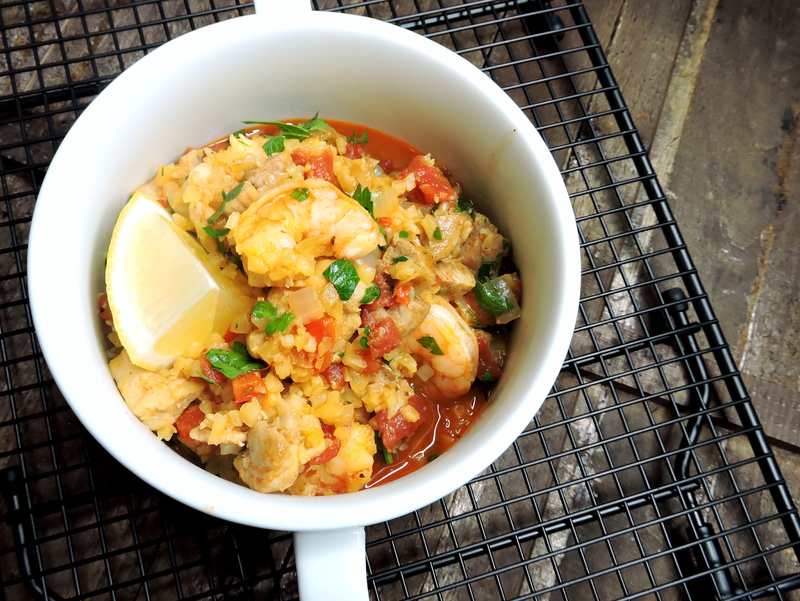 I use a combination of three meats: chicken, chorizo, & shrimp. You could also add mussels, scallops, or any other seafood to keep that traditional Paella vibe. & If you're not familiar with saffron, don't be intimidated. We bought ours from Whole Foods, and it comes in a small pouch of threads. All you need is one pinch of those threads, stirred into this dish & left to simmer. You'll have an amazing unique flavor & the gorgeous golden color you see in my "rice"! Heat the olive oil in a large skillet over medium heat. Add the onion, garlic, and bell pepper. Sauté for 3 minutes to soften. 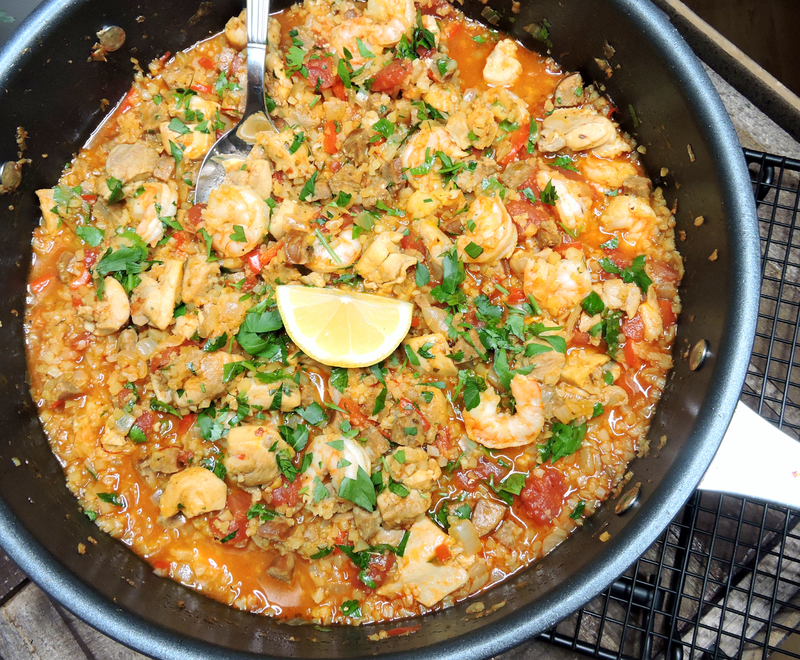 Add the chicken & chorizo, and continue to sauté for 4-5 minutes, or until the chicken is lightly browned. Turn the heat up to medium-high, and stir in the riced cauliflower. Sauté for 2-3 minutes to get it cooking. Stir in the diced tomatoes, chicken broth, spices (saffron, paprika, oregano, thyme, red pepper flakes, salt, & pepper), and bay leaf. Bring to a boil, then reduce the heat to a simmer for 15 minutes, stirring occasionally. Stir in the shrimp, then cover the pan & continue to simmer until the shrimp is cooked (it should be pink & opaque), about 3 minutes. Remove the bay leaf, and sprinkle the dish with fresh parsley. Serve hot with lemon juice squeezed over top. I used one bag of frozen Organic Riced Cauliflower from Trader Joe's and it worked perfectly! You could also "rice' your own. I use bone broth to bump up the nutrients, but any broth will do. I use fully cooked chorizo from the Fra'Mani brand at Whole Foods Market. I dice it into small pieces before browning. If you are using raw chorizo sausage, be sure to remove the casings and cook it thoroughly along with the chicken in step 2.